يشكل فندق فندق نيكو جوام بموقعه الممتاز في قلب طمون باي نقطة انطلاق ممتازة لاستكشاف جوام. لا يبعد الفندق كثيراً عن مركز المدينة، فهو يقع على بعد 1. Km منها. في حين يستغرق الطريق منها إلى المطار حوالي 15 دقيقة. بالنسبة لمن يريد الخروج، هذه بعض المعالم السياحية المتوفرة للزوار Gun Beach, FaiFai Beach, JP Super Store. كما يقدم فندق نيكو جوام الكثير من الخدمات لإغناء رحلتك في جوام. يقدم الفندق واي فاي مجاني في جميع الغرف, معبد, متجر, مكتب الاستقبال على مدار الساعة, مرافق مخصصة لذوي الاحتياجات الخاصة لضمان الراحة القصوى لضيوفه. ادخل إلى واحدة من الغرف 492 وتخلص من عناء نهار طويل بمساعدة مجموعة كبيرة من الخدمات كمثل مناشف, تلفزيون بشاشة مسطحة, اتصال لاسلكي بالإنترنت, اتصال لاسلكي بشبكة الإنترنت (مجاني), غرف لغير المدخنين الموجودة في بعض الغرف. كما أن مجموعة الخدمات الواسعة الموجودة في الفندق لضمان راحتك تترك لك الكثير من الخيارات لقضاء وقتك أثناء فترة إقامتك. إن فندق نيكو جوام هو خيار ذكي بالنسبة للمسافرين إلى جوام، بما يوفره من إقامة هادئة ومرحة. ستُفرض على الأطفال الذين يستخدمون الأسرّة الحالية رسومًا مقابل وجبة الإفطار. يتم تحصيل الرسوم في العقار. Not so near the city Center but not that far either. There’s a shuttle that takes you to most attractions 2 day pass only for 12 dollars. There’s a private beach but have access to the other beaches. The hotel show is not interesting just fire dancers. Better to book other shows. Great amazing room views. 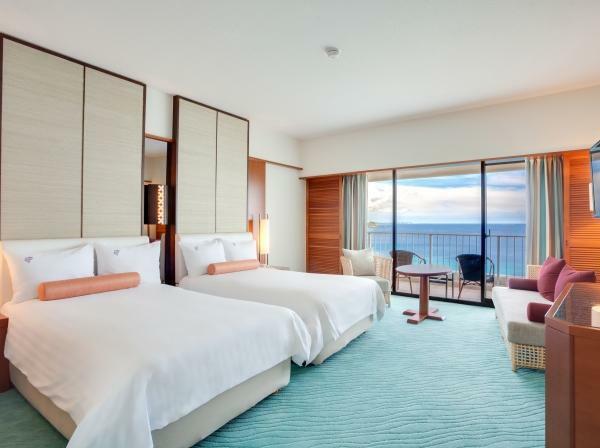 All rooms face the beach. We booked our room for our wedding in Crystal Chapel which is under Nikko Hotel 5 month ago. Our room was facing to the beach, the view was fantastic. We had quick lunch during our busy wedding ceremony, the sandwich and sushi bento was not good. The rice in sushi was hard, not fresh. We felt disappointed for the hotel management who could not arrange us a double bed, even they knew our booking made in July 2018 (5 months ago) for our wedding. They offered us 2 single beds, and explained to us the hotel is full booking. And they don’t hv the bed cover and sheet to wrap 2 beds in 1, but just pushing 2 beds together with a gap. It doesn’t up to a 4 Stars ⭐️ Hotel standard. Overall, the facility was ok, e.g the pool, slide, chapel was stunning, the staff were very friendly and helpful. I have stayed both Sheraton and Nikko in my 5-days trip. Nikko has a better view with Tumon Bay side than Sheraton. 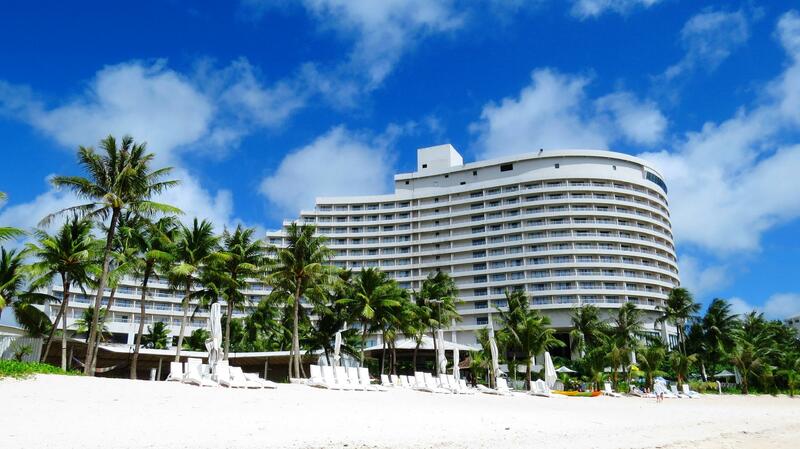 However, Sheraton has better services which allow early check-in and check-out. The infinity swimming pool in Sheraton is better for couple where the swimming pool in Nikko is better for family with Kids. Location of Nikko is not an issue for me as the free DFS shuttle bus and Lam Lam bus come in every 5-8 mins. However, you definitely need a rental car if you decided to stay in Sheraton as no free DFS shuttle provided. All in all, I had a great stay in both Nikko and Sheraton and no regret. 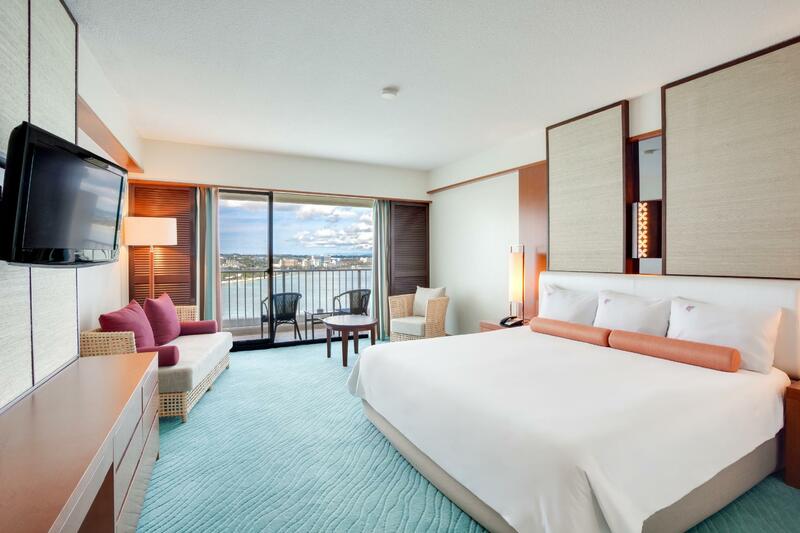 I would suggest to get a Premier room with Tumon Bay view in Nikko with Premier Lounge access and also Ocean view room with Club Lounge access in Sheraton. It was my second visit to Guam, and I stayed at 3 hotels in total, including Nikko, but by far, Nikko was the worst hotel I’ve ever been to. Lobby is, actually the hotel itself is, in an open space, and considering the fact that Guam is hot and humid, it’s just unpleasant to be there. Nevertheless, room was soggy, and the sheets were damp the whole time we were there. AC couldn’t solve this problem at all. Water pressure during shower was literally dripping, and it was easy to find big sized bugs within the room every night. Although the pool was nice, and the staffs were kind, due to above reasons, I hardly got any rest, and have no plans to visit this place again. I found peace, when we checked out. I know a lot of hotels are old in guam but it was not value for the price. a shower curtain looks not clean. They need to change new. It was just hotel no more no less. And Service was good. 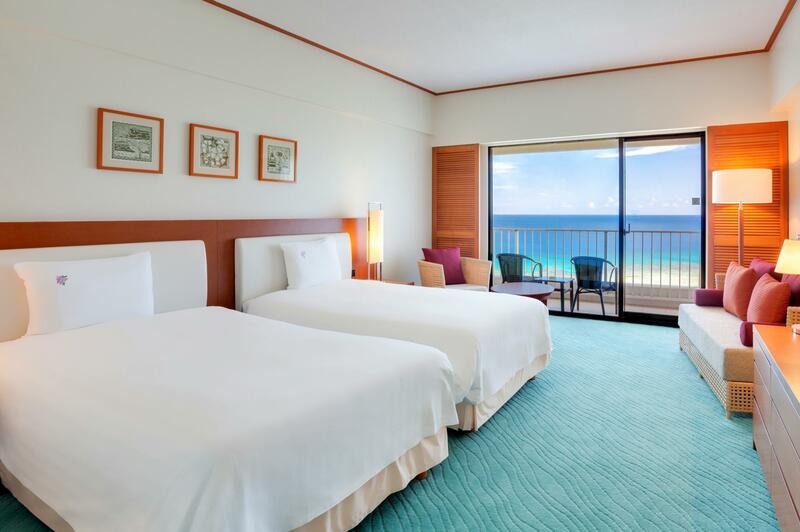 If i have a chance to travel to guam again, it looks like hard to choice hotels where i'll stay. I was fascinated by the scenery outside the overwhelming window. It is also a great advantage to be able to use the pool and the beach together. It was the best hostel for our family with children. My stay at Nikko was good overall, however there were some small problems I'd like to point it out. First, this hotel has no room service and valet parking, so it can be a bit inconvenient. Also we found some bugs in the room, but the room is quiet clean, so I don't know if it's because of the island. One more thing is some of the hotel staff are Japnese and are not very good with English. On the good side, the hotel is in the corner so you get a really good ocean view. And the pool is big enough and kids are going to have fun there. The management of this hotel was not flexible and it’s not considerated. We booked the rooms for 2 days by seperated bookings, but the hotel staff asked us to check out b4 12:00 the other day and check in again after 15:00. It made us so inconvenient. We travelled in other countries, but we never met such an illogical requirement. Fortunately, under our request several times, the duty manager finally helped us to solve the problem, but it made us trouble. Frankly speaking, the view of every room in this hotel was very good, we could have a big sea view n feel relaxed. The location of this hotel is a little bit far from the city center if by walking, and there is a good choice that you could also choose the free shuttle bus of DFS to the city center where you could enjoy many types of food in various restaurants. I spent one night in transit each way going to/from Guam. I stayed at two different 4-star hotels since I was unable to book a room in the same one. Everything at the Hotel Nikko was fine, but I must say that I preferred the other hotel, which was cheaper, more convenient and had a more accomodating staff. Still, there was nothing WRONG with the Nikko. The view of the beach from my room was absolutely stunning and the room was very nice (especially the soaps). There is a 24-hour convenience store in the lobby, good outdoor swimming pools with comfortable hammocks on the side and it's just a few minutes walk to the beach and the (very small) Lina'La Cultural Park. It's about a 20-minute walk to the main shopping strip, or you can take a shuttle bus. A little bit far away from downtown area but still you can take a 10-15 mins walk from there. Sea view available from all rooms. Better to ask for higher floor for better sea view. Room is clear, swimming pool is nice, the private beach is excellent! This hotel is not so valuable. Room was not clean expecially the bathroom which has various hair on the floor. I could not organize my stuffs very well because of a few storage furnitures. Swimming pool was not big enough so that there were rush. Premium lounge service was not necessary because they do not provide meaningless food and drink usually and liquid time is very short and even it is dinner time. Who stays there in dinner time? There are not any palces to take a walk in the hotel. Breakfast vouchers were useful because we could select between 3 restaurants. Btw staffs were kind. The location is quite far away, but a free shuttle has been provided from DFS until 10:30pm. The staff are nice & helpful. If you are seeking for a silence ocean view, it is a good choice for you. The room given to us (for our anniversary) was simply great, large, clean, comfortable and balcony facing the ocean and chapel. totally enjoyed our stay there and we would definitely go back.